When you hear about the impact that industry is having on the Amazon, deforestation is one of the first things to come to mind, however oil development is making a huge impact in terms of biodiversity loss, indigenous conflict and widespread air, soil and water pollution. The image below makes a shocking point about the magnitude of the devastation that oil companies are bringing to the Amazon’s waterways. 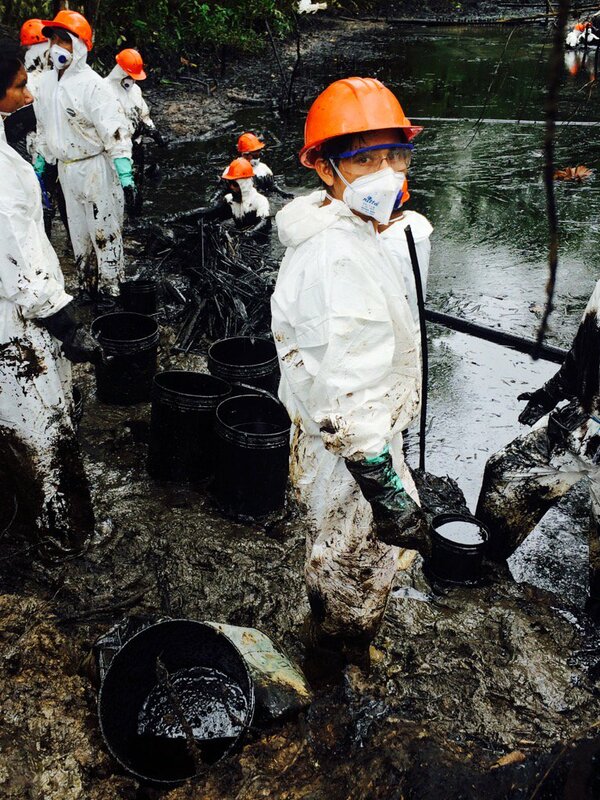 It shows unbelievable contamination where the waters have turned completely black. 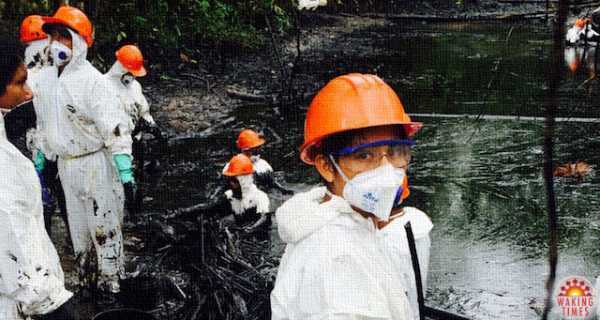 It shows indigenous people working to clean up oil spilled by Petroperu’s Northern Peruvian Pipeline in early 2016. After the spills, two tributaries that serve as a source of fresh water for eight indigenous tribes that live in the Peruvian Amazon were filled with 3,000 barrels of oil. The Amazon river is about 4,000 miles (about 6400 km) long, and is the home of over 3,000 species of fish including the boto, also known as the pink river dolphin. Furthermore, it is the largest river in terms of water discharge in the world, responsible for about 20% of the Earth’s fresh water entering the ocean. Oil pollution of this magnitude is not only killing the biodiversity of the Amazon River and its tributaries, but it also affects the delicate ecosystems of the oceans. Below is a short video that further shows the shocking effect of Petroperu’s oil spills. This indispensable region of planet Earth is under continued threat. Its animal and plant life is increasingly pushed towards endangerment. In addition, the indigenous people are mistreated by failed government policies and unscrupulous companies, such as Petroperu. Oil development in the Amazon is still on the rise. Not long ago, the public was outraged at the Ecuadorian government for permitting oil exploration in the Yasuni, one of the world’s most ecologically diverse places. In Peru, a serious political struggle is underway to prevent drilling in one Peru’s biggest oil blocks. Companies like Texaco, Chevron and Occidental petroleum have been defending themselves in court for decades to evade penalties for trashing the Amazon and causing widespread public health crises. Furthermore, China has started participating in oil development in the Amazon. Their unprecedented investment in Amazonian oil has started one of the largest oil booms in history. As a result, the rainforest is quickly being crisscrossed with pipelines. This threat to the Amazon is expected to grow significantly over the coming decades. Corporations are bleeding the area dry of its finite resources and responsible for mass ecological and climatic damage. The continued devastation of the Amazon will have massive global implications, as its plant ecosystem stores 17% of the world’s carbon which helps regulate the Earth’s temperature. The region is often referred to as “the lungs of the earth” as it produces substantial amounts of oxygen, supporting countless lifeforms. This article (Viral Image Shows the Impact Oil Companies are Having on the Amazon’s Waterways) was originally created and published by Waking Times and is published here under a Creative Commons license with attribution to Anna Hunt and WakingTimes.com. It may be re-posted freely with proper attribution, author bio, and this copyright statement.